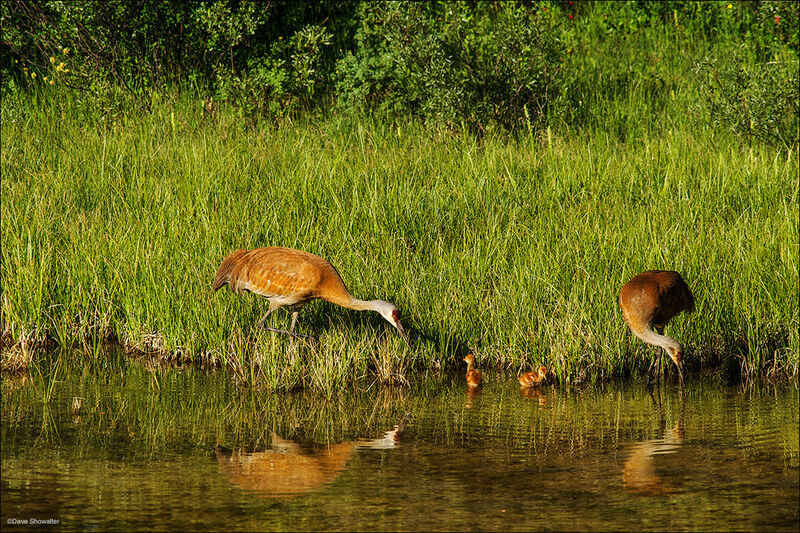 Sandhill cranes with colts (chicks) feed in a wetland near the Hoback River. The area was severely threatened by planned industrial scale natural gas development and is now protected. A strong grassroots effort led to the purchase of the gas leases by Trust For Public Land, who retired them forever - giving the land back to the American people. The Rocky Mountain Population os sandhill cranes are Greater sandhills that migrate from winter range at Bosque Del Apache in New Mexico to Greater Yellowstone from spring through the end of summer, where they mate and raise their young. By September, these tiny colts are juveniles ready to fly 500 miles to New Mexico. Photo © copyright by Dave Showalter.